It was a long afternoon as I flew from Madison, WI to Chicago IL and finally Detroit, MI. However, the trip was worth it just for this first day. 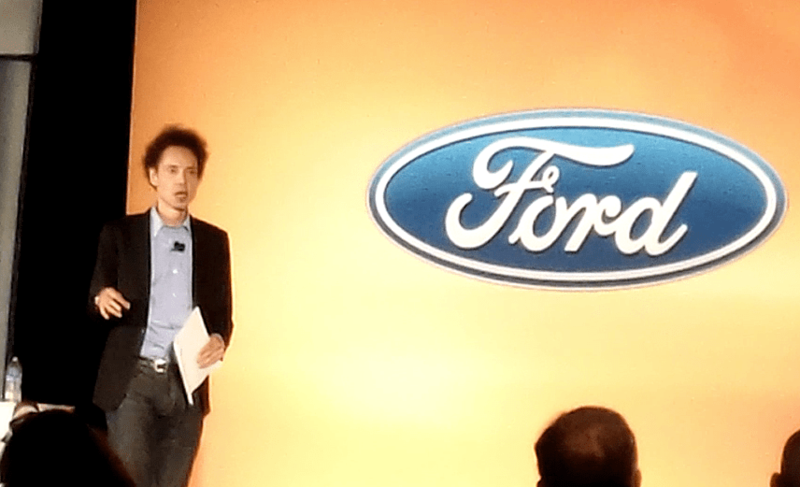 The best part, I am here to learn about how Ford is changing the way we drive our cars. I got to my room around 6 pm. A quick assessment of gear, a shower and I was out the door to the opening Keynote. Pretty amazing room – I am in the Oliver Wolcott house for this stay. It’s a replica of his house (from Litchfield, CT). Wolcott, of course, is one of the men who signed the Declaration of Independence. Wolcott later became Governor of Connecticut. 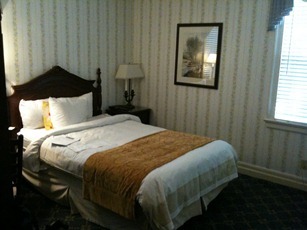 In the upper suite – a 2 room hotel with 2 bathrooms, I have a place to work, a place to relax and a nice bed to sleep in. The keynote was held over by the Ford Museum. I ran into Andru Edwards from Gear Live, Helena Stone from Chip Chick, Michael Reyes from Hardware Geeks, Judie Stanford from Gear Diary and CC Chapman. So the room was full enough with superstars, but then Ford came out with more. Alan Mulally, CEO of Ford came on to welcome us. Ed Begley Jr. was at the front table (who will be speaking tomorrow) watching Malcom Gladwell deliver the opening Keynote. I have to admit, I did not know who Malcom was. I heard of the book “The Tipping Point“, but haven’t had a chance to read. He got up and completely blew me away with what he had to say. Now, I have to preface this to say I might have been told this before. I like to believe that we live in a “7 time” rule. That means I will learn in one of two ways – either I try something and learn quickly from failing miserably, or someone will have to tell me something 7 times – by the seventh explanation I finally get it. Malcom was the exception to the rule. He started talking about Baseball – how the players used to accept the low pay – in hopes they sold a million baseball cards. Then one person – Bobby Bonds – came in and asked the question why. He asked 2 questions: How the beliefs the consumers have affects their world. He also tries to convince how a handful of ideas create a dramatic shift in the way people perceive themselves. Malcolm continued on stories of paradigm shifts. He noted that a Lawyer in the 1930’s made more money than one in the 1950’s. He talked about how the Supermodel came to be – when someone asked why they were only making $60 an hour. When it was all said and done, they ended up making $25,000 a day. Sustainability and aging demographics. Malcolm sees the trends from the 1970’s, except opposite. In the 70’s there was a resistance to authority. The new trends are about an appeal to authority. Behavior has changed. They don’t reject authority, they partner with authority. Case in point, Malcolm talks about how savings and loans are in a paradigm. When Sony had their servers hacked and stole credit card info, we didn’t pull our money from the banks. We asked for the S&L to step up. The rest of the evening was meeting new people and talking about what to expect. Then it was back to the hotel where I could put down my thoughts for the day. Doug Outhout Answers What is Converged Infrastructure – #HPDiscover 2011 A Spirit in the Clouds? Pictures of Mysterious Light on My Flight.